The pro model includes an additional body cover for further protection from wearing and damage from its surroundings. The outer-shell is constructed from a durable synthetic material, making for a highly durable and aesthetically stunning spa. It is also lined with a special heat retention material. The complete spa package is contained in one box making it as portable as it is easy to assemble. Seating: 2 adults + 2 kids. Water capacity: 700 litters / 185 gallons. Heater: 1320W – Max water temp 104° (40ºC). Outer Dimensions: 69 inches x 25 inches (175cm x 50cm). Inner Dimensions: 55 inches x 20 inches (140cm x 50cm). Plugs into household standard AC outlet equipped with GFCI. 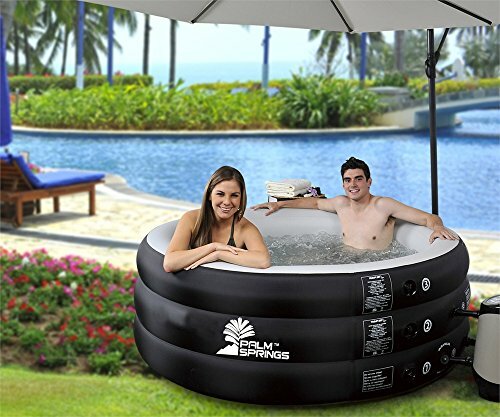 Package includes: Spa inflatable hot tub, hot tub body cover with zippered top for added protection, filter pump & filter, inflation hose, instruction manual with “how to” assembly, repairs, and troubleshooting and a warranty 6 months for spa – 12 months for electric pump (Punctures to spa during use/assembly not covered under warranty).